The Greubel Forsey Balancier Contemporain takes design elements from the existing Balancier and Contemporain collections, and even the Signature 1, and packages it in a highly legible, easy to wear 39.6 mm x 12.21 mm case. This is their smallest watch yet. At the heart of the new Balancier Contemporain is Greubel Forsey’s balance wheel system which was developed and manufactured in-house at the company’s factory just outside of La Chaux-de-Fonds. Initially launched in the Balancier, in 2017, the large 12.6 mm diameter balance wheel which was built with chronometry in mind, initially came in a 43.5 mm x 13.94 mm asymmetrical case. To enable fine adjustment of its moment of inertia, the balance rim is fitted with six gold mean-time screws, recessed in order to guarantee optimal aerodynamics by reducing air friction. Fitting this large balance wheel into a smaller case required a new movement construction. The resulting caliber is manually wound (32.40 mm x 9.20 mm), consists of 255 components, included 33 jewels, and features a 72-hour power reserve via two series-coupled fast rotating barrels (one of which has a slipping spring to avoid overwinding). The movement is also equipped with a crown-activated hacking feature to stop the balance and set the time to the nearest second. The case finishing is superb, of course, featuring a polished bezel and lugs, while the caseband and caseback are satin-brushed, creating a nice contrast, but this is not significantly different from most Swiss watches other than the level of detail put in to the case finishing. What is different, however, is that key movement components are on the dial side, and they are finished to the absolute highest level. At 2 o’clock is an offset hours/minutes dial with blued-steel hands and hand-polished countersinks with flat-polished centers. Just below is the large opening for the balance wheel, gear train, and three-dimensional tripod bridge. Located at 10 o’clock, on a slightly lower level, a finely hand-frosted bridge houses the power-reserve display graced by a slender blued steel hand. Just below it, between 8 and 9 o’clock, the small seconds rotates continuously, supported by a frosted and beveled bridge providing a glimpse of the gilded barrel drum with Greubel Forsey engraving. “Proudly showcased at 6 o’clock in keeping with its stature, the exclusive balance wheel is set against the background of a bridge meticulously hand-polished by an experienced craftsman to obtain the famous mirror polish that is a supreme goal for watchmakers. The balance wheel pivots at the top in a slim, carefully beveled and flat black-polished bridge. This perfectly balanced composition is framed by a slim white gold bezel, while a high-domed sapphire crystal ensures optimum transparency.” according to Greubel Forsey. The center of the dial has an engraved circular red gold plate with the GF logo and the individual limited-edition number. 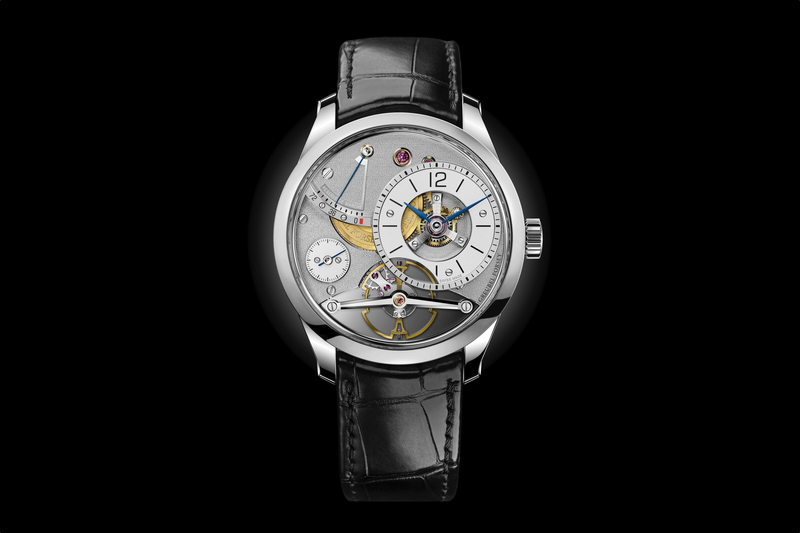 It is surrounded by a white gold bridge, relief-engraved with the key Greubel Forsey values and black polished. Further enhancing the look are olive-domed jewels in gold chatons, with finely polished countersinks reflecting the deep red hue of the stones. Located between 10 to 11 o’clock, the remaining power reserve is indicated by a blued, downward pointing hand, with a polished countersink at the top. 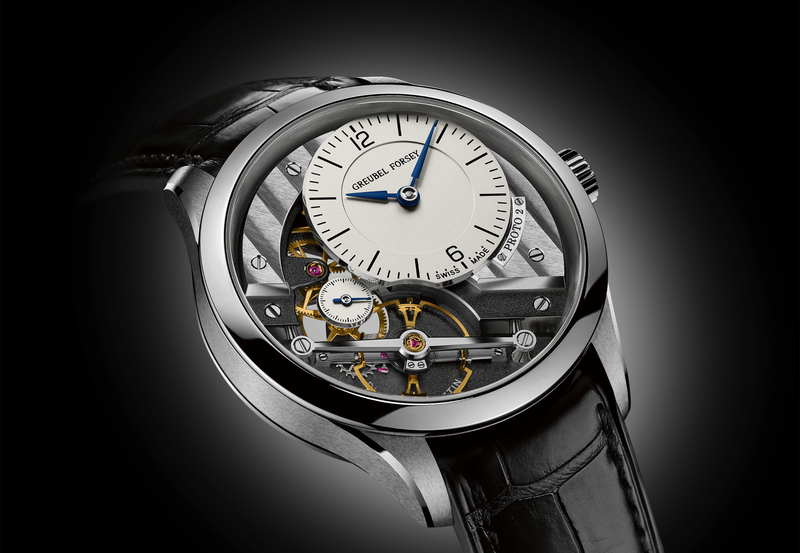 The caseback is held by gold security screws, and is signed with raised polished engraving – “Greubel Forsey” and “Balancier” – on a hand-punched background. Water-resistance is 30 meters. Redesigning the case and movement has resulted in an arguably more attractive aesthetic without sacrificing the incredible finishing or chronometry, which is a signature of Greubel Forsey, all within a more accessible price point, relatively speaking. 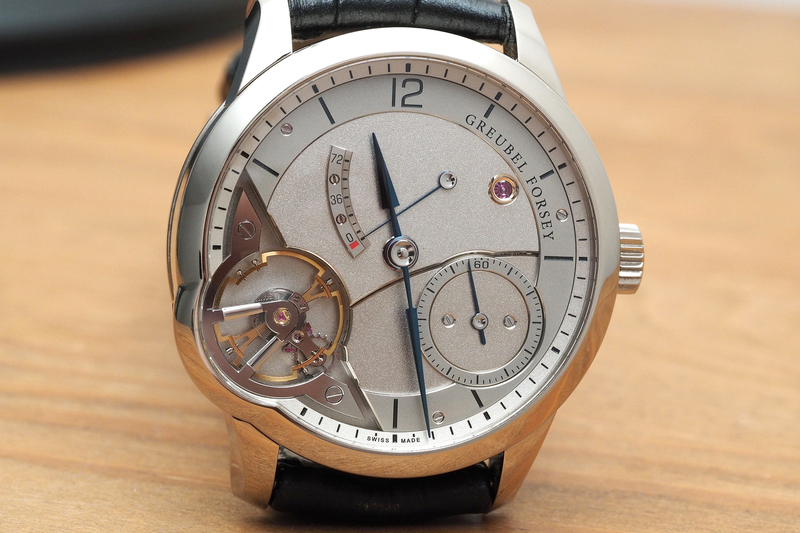 The Greubel Forsey Balancier Contemporain is limited to 33 pieces and comes in 18K white gold. Retail is approximately $195,000. Learn more at Greubel Forsey.